What is SharePoint Learning Kit? SharePoint Learning Kit also known as SLK is an E-Learning delivery application that is built to run on top of SharePoint 2007 and 2010. The certified SCORM 2004 product allows content from a SharePoint document library to be assigned, tracked and then marked to a group of learners. Supporting SCORM 2004, SCORM 1.2 and Class Server content the learning resource can be assigned by the individual to themselves and to a group. This SharePoint feature can be used in all version of SharePoint including the Windows SharePoint Services 3.0 and SharePoint Foundation 2010. SharePoint Learning Kit is currently at version 1.5 and available in 29 international languages. To download SharePoint Learning Kit navigate to http://slk.codeplex.com and click on the download button. With SharePoint Learning Kit there is one web part that is called the Assignment List Web Part which has 2 functions. 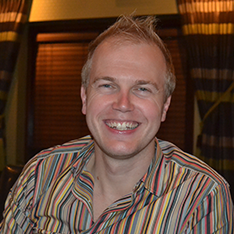 For the instructor it allows the member of staff to see the number of students that have submitted work. For the Learner it lists all the assignments they have to complete in that SharePoint site. When a student logs into the site and has the Assignment List Web Part of their page they are given a list of all the assignments they have to complete with the score they can achieve. To start the assignment the learner will select the name of the assignment which will take them to a holding page that will list information such as the description, date of completion and the final score they could achieve. To start the assignment they select Begin Assignment. If a SharePoint User is assigned as a SLK Instructor they have the permission to assign files from a document library to any assigned SLK Learners accounts. Once an assignment has been set, the Assignment List Web Part will list the assignment name and the number of students that have submitted their assignment. 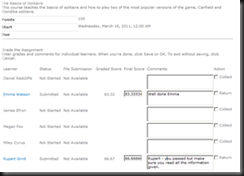 An instructor can select the assignment name from the Assignment List Web Part and then view the score the student received from the assignment. As this assignment was a SCORM file with questions set out in the assignment the server has automatically given a score to the student. This score can be changed by the instructor and then any comments that have been added are sent back to the learner for them to review. Both the instructor and the learner can use the E-Learning Actions button. This feature turns the document in a document library into an assignment allowing you to assign the file to yourself as an individual or a group of learners. On the following page the user is asked if they would like to assign the document to themselves. If the user is an SLK instructor they will also see the name of the site that they can assign the resource to. Having selected a group you can then select the date the assignment should appear in the student Assignment List, when they have to have the assignment completed by and any other instruction you may want to give them. Towards the bottom of the page you can then select either to assign to the whole group or different individuals. 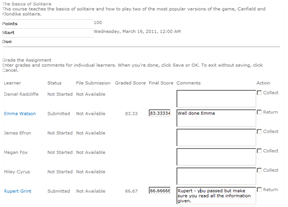 You may want to use this feature to assign different levels of work to students with different abilities in the group. how do i get started creating content. is there a step-by step tutorial somewhere. I have already installed it and activated in sharepoint 2010.? I am researching using SharePoint for our LMS. There is very little out there I can show my manager. I’d like something that documents what the SharePoint LMS can do, what is needed (is the SLK enough) and how involved setting it up would be. Do you have something like that, or can you point me to somewhere I can find it? Can you see the whitepapers we have. Take a look in the navigation bar of our website. Can you clarify if SLK will support LCMS. If I want to convert Word or PPT in the SCROM compliant it is possible.